She’s wearing her most recent project, the beautiful Fleece Artist “Lady of the Lake” cardigan. The kit comes with a pattern, 250g curlylocks and 300g kid aran. It’s a quick knit with two strands of yarn knit together on 6.5m needles. Valerie, who works in Edgemont two days a week, also knit a Lady of the Lake, in a beautiful shade of blue. It’s currently on display in the Edgemont store window. 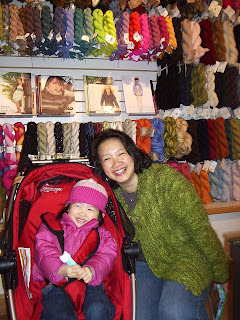 Accompanying Ingrid is the adorable Miss Millie in a cute little handknit hat, natch. Four year old Teddy usually comes along but he was at pre-school yesterday. Teddy first visited when he was three weeks old and Millie was probably even younger. Hopefully these kids will be knitters someday soon. Warning: this project has addictive qualities. A customer recently commented that some mini Babettes knit in cotton would make beautiful placemats for summer patio tables. What a fantastic idea, thanks Jane! 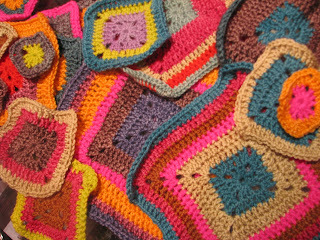 Learn how to crochet a Babette blanket at our May 4 workshop, 1 – 4 p.m. Phone the store or email us for more information. This class is almost full so don’t delay. Our special yarn this week is Crystal Palace Waikiki at 40% off the regular price. Waikiki is 62% viscose and 38% cotton and knits at 5 – 6 st per inch on 4mm needles. Check out all of our yarn specials right here. We’ve also restocked lots of the popular Perl Grey Ring and Stick pins. And we have a new selection of shawl pins from our talented local woodcrafter, Dale Ramsay. These are gorgeous pins in a great range of colours, shapes and sizes. Photos will follow soon. 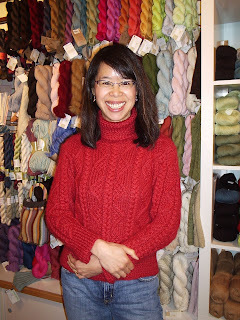 Kim Werker was all set to shoot the Summer 2008 issue of Interweave Crochet in Vancouver one day last week. The photographers and models were booked, the garments were ready and everyone was scheduled to meet at the beach early one morning. And then it started to snow. Snow in Vancouver at the end of March? Unbelievable. Pretty much destroys your Summer photo plans. But Kim is unflappable. She called her LYS and we were happy to oblige. The team set up at Point Grey and shot away in the midst of a busy shopping day with a couple of classes adding spice to the mix. It was a lot of fun. Can’t wait to see the new issue. We unpacked more stuff this week. There’s a new 100% Camel yarn that you’re going to like. It’s supersoft, with 230 metres to the ball for only $8.95. We have some new colours of Elspeth Lavold Silky Tweed and Silky Wool. And we opened a big box full of Lantern Moon bags, needles and accessories. Have you seen the cute little Notepad Holders with a yarn and needle motif on the cover? These are great knickknacks for any yarnoholic. We also have more of the popular Sheep Tape Measures. There’s one black sheep in every bunch! And we’ve ordered Sivia Harding’s beautiful new RiverRock beaded scarf pattern. It will be in the stores early next week. 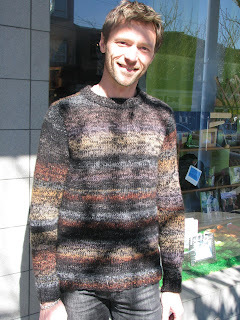 It’s knit with a combination of BSA Alpaca Silk and Noro Silk Garden. What a great sweater and also a perfect fit! It’s knit with Debbie Bliss Cashmerino Aran. Doesn’t the colour suit her perfectly? A perfect colour combination. 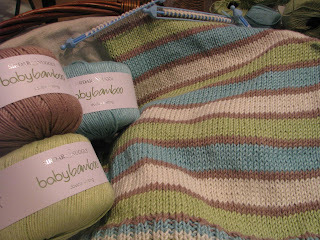 Baby Bamboo is an incredibly soft yarn that’s 80% bamboo, 20% wool. There’s a great colour range, with four punchy new colours for Spring. We’d love to see what you’re working on. Send us photos of your completed projects and we’ll post them on the blog! Have you seen these videos on You Tube? And you probably already know that You Tube has tons of instructional videos on various knitting and crochet topics. Our Tuesday special this week is Grignasco Rapsodia at 40% off. It’s a nice boucle yarn that’s 55% wool and 45% dralon. And we recently added some new colours of some of our specials, including Debbie Bliss Merino Aran and Merino DK. There’s a gorgeous new Merino Aran buttery-yellow shade. We also have some pretty new colours of Grignasco Karma. Check out all of our current specials right here. We have more price reductions to report… Addi-turbo prices have dropped by almost 15%, we’ve re-priced many sizes from $20.95 to $17.95. We can’t re-label our existing stock but we’ve changed the computer prices so you’ll receive the lower price at checkout. And if you’re uncertain about any of our prices, just ask us! And thanks for all the positive feedback on the possible DB Whistler Retreat. We’ve started a list of names and we’ll contact everyone on the list when we have more information.